Born in France, Erik FELLER studied the piano and music theory at the Conservatoire of his native city, while also studying the organ. He went on to study at the César Franck School in Paris, with L.Souberbielle.At the Bordeaux and Orsay Conservatoires, he became the student of Francis Chapelet, and then of André Isoir. Between 1980 and 1983 J. Marichal invited him to take his position at the choir organ of Notre-Dame Cathedral in Paris. He made his first recording with the choir of Notre-Dame,in the cathedral. He also studied with Pierre Cochereau. Erik FELLER is open to the techniques of modern music and film scores, and he has taken part in many festivals. He teached during 15 years the organ at the Niedermeyer Conservatoire near Paris. On the occasion of J-S Bach year in 2000, he recorded for the first time ever the six Partitas for keybord (BWV 825 to 830) and transcribed them for the organ, but also the Goldberg Variations (J.S Bach) on an Historical Silbermann Organ in Germany. In 2002, he did a world premiere recording of the Great Studies of S. Neukomm on the new Grenzing organ in the Cathedral of Madrid (Spain). 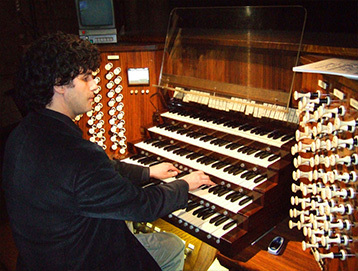 Erik Feller is pursuing his career as an international concert organist and as a wide list of recordings. "Erik Feller has a sense of vast spaces, monumental architectures. He is a man of this time, an inspired musician who transports us in a world of greatness, generosity and ideal".